I feel so honored that one of my layouts was chosen as Layout of the Month at Swirlydoos. 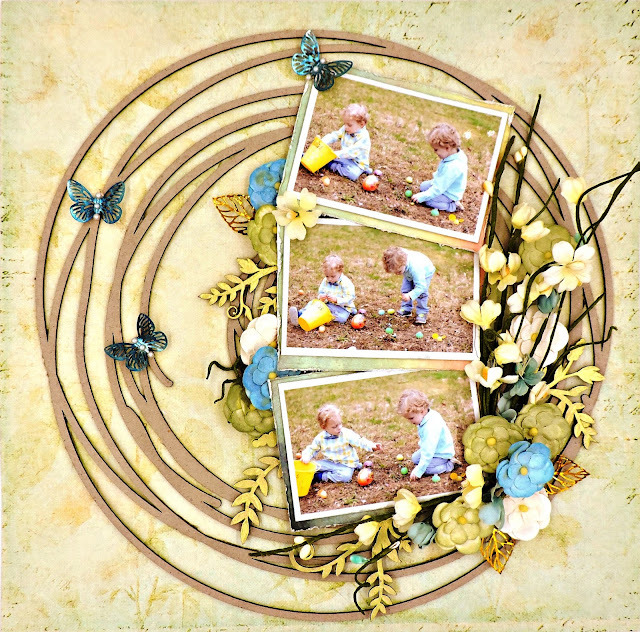 This was created for the April Round Robin challenge, where the theme was "Spring" and nothing says Spring like these photos taken by my DIL on Easter Sunday during the Egg Hunt. As you can see, the twins did quite well for themselves! Kim asked for some much loved (and therefore hoarded) scrappy supplies and I decided that it was time to let go: one of the last of my Flights of Fancy papers by Prima from the March 2010 Swirlydoos kit and a bit of my Fairy Flora paper that (I think) came from a special Swirly order around that time. I've also dusted off some Blue Fern Studio chippies, Prima vines and a package of Prima flowers that I'll admit to hanging on for far too long. I've colored most of my flowers with Color Blooms, changing them to green and blue. The Blue Fern Vine was coated with Opal Magic and cut apart to scatter around the page. The metal leaves and butterflies were coated with alcohol ink. Thanks so much for stopping by for a peek!! !